The feature of this rhododendron described by the epithet barbatum is barely discernible in this image. Barbatum translates to “bearded”, and refers to the hairs present on the petioles (the leaf stalks) – if you look closely, you should be able to see a few long hairs on the stalk of the leaf in the lower right. 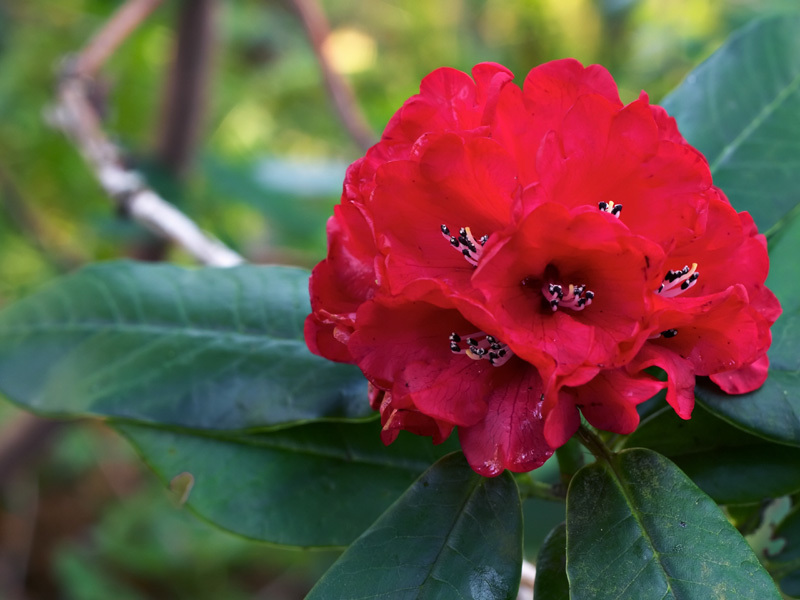 Rhododendron barbatum is native to the Himalayas; for the taxonomic description, see Rhododendron barbatum in the Flora of China. Photography resource link: Canon EOS Beginners’ Frequently Asked Questions is a comprehensive suite of questions and answers particularly for new users of modern Canon SLR cameras, but much of it is useful for any photographer. That is an astoundingly beautiful rhododendron. I remember reading a pean to a ‘hairy’ rhododendron by a deceased tibetian lama. Now, I have a picture to go with that poem. BPOD is a wonderful site. Might I reccomend making a small button in the form of the following? That would facilitate other web developers who are reluctant to use large advertisements to support your site. Some specimens are barbless. If you plant one of these in USDA 7 it will freeze. John, I’ll add that to the growing to-do list. I don’t mind providing a button. so beautiful flower.. but i think it will be more batter if you describe about this flower. i love this flower . this flower is the NATIONAL FLOWER of my country “NEPAL”…. We viewed one of these in the Wicklow area of Ireland, at the Mount Usher Gardens. Spectacular.